With just a few weeks to go until Valentine’s Day it seems like a good time to start sharing heart-shaped favors and other fun stuff! Now, soap might not be the first thing you think of when you’re considering wedding favors but this could be a really fun addition to a care package for your out-of-town guests. You could put together a fun gift bag with these heart-shaped soaps, a couple bottles of water, some snacks, and more. Or you could put a display of the boxes out at the reception and let the guests take one as they leave. 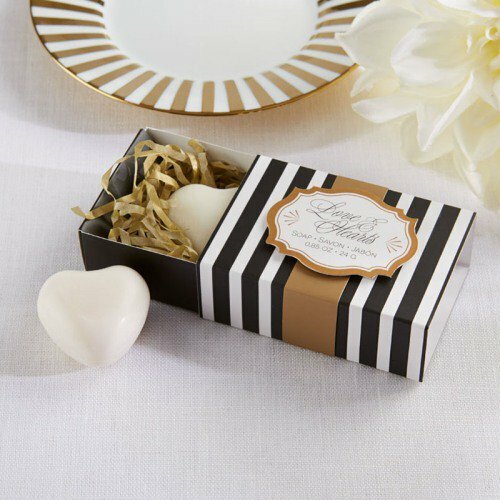 Plus, the boxes for the soaps are just elegant enough without being too fussy. You’ll find these heart-shaped soaps here.